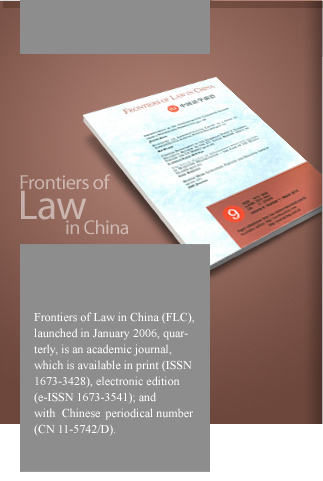 field of law who are interested in Chinese law and comparative law between China and other countries, and the related legal issues that explore the significance of the contemporary reform of Chinese law and Chinese legal system. Starting from 2010, FLC has gone through a thorough adjustment. Rather than selecting the published top articles for translation, we are now asking for original papers in good quality written in English. All the manuscripts will go through peer reviews before being accepted for publication. Manuscripts for FLC should be submitted via http://mc.manuscriptcentral.com/flc. Authors should not simultaneously submit it to another journal, nor has the manuscript been published in any other publication in any language in a substantially similar form and/or content. work was carried out, together with the postal code(s) and email address(es) of the author(s); and (v) an abstract of 200�C250 words. (2) Figures are to be numbered consecutively in the form of Fig. 1, Fig. 2, etc. Preferably, figures should be in clear graphics that can be reproducible. Legends with unreadable font or too thin lines must be avoided. Moreover, figures should be coherent with the text, and be captioned informatively, in order to be understood without referring to the text. (3) Tables are to be numbered separately, and to be numbered in the form of Table 1, Table 2, etc. Each table should have a simple title. Tables should contain only horizontal separators, namely, a double horizontal bar on top and a single one at bottom. Vertical separators must be avoided. 1. Robert Z. Lawrence, Rulemaking amidst Growing Diversity: A Club-of-Club Approach to WTO Reform and New Issue Selection, 9(4) J. Int’l Econ. L. 824 (2006). 2. Bernard M. Hoekman & Michel M. Kostecki, The Political Economy of the World Trading System �D The WTO and Beyond (2nd edition), Oxford University Press (Oxford), at 104 (2001). 3. John H. Barton et al., The Evolution of the Trade Regime: Politics, Law, and Economics of the GATT and WTO, Princeton University Press (Princeton), at 47�C48 (2006). 4. Supachai Panitchpakdi, The Future of the WTO: Addressing Institutional Challenges in the New Millennium, para. 134, at http://www.wto.org/english/thewto_e/10anniv_e/future_wto_e.htm (last visited Apr. 5. Roberto M. Unger, Law in Modern Society: Toward a Criticism of Social Theory, The Free Press (New York), at 48�C58 (1976), in Shuzo Shiga, 中国法文化的考察――以诉讼的形态为素材 (Investigation on Chinese Legal Culture ― Litigation Pattern as Material), (3) 比较法研究 (Journal of Comparative Law) 19(1988). acknowledged; also, the contribution of colleagues should also be mentioned. This part is to be placed at the bottom of the front page. The first author will be asked to sign a Copyright Transfer Statement, and co-author(s) will sign a Power of Attorney commissioned to the first author (if any) before having an article published in this journal. In signing the document(s), it is assumed that author(s) has/have agreed with the conditions stated in the Statement and authorized the publisher(s) related to use any copyrighted or previously published material in his/her article. The article cannot be published in FLC until the signed document(s) is/are received.